Free Shipping Included! StudioFX 400W Chromakey Green Screen 6ft x 9ft Backdrop Photography Video Lighting Kit - Background Support System Included - by Kaezi CH69G by StudioFX at Marco Marcucci. MPN: CH69G. Hurry! Limited time offer. Offer valid only while supplies last. 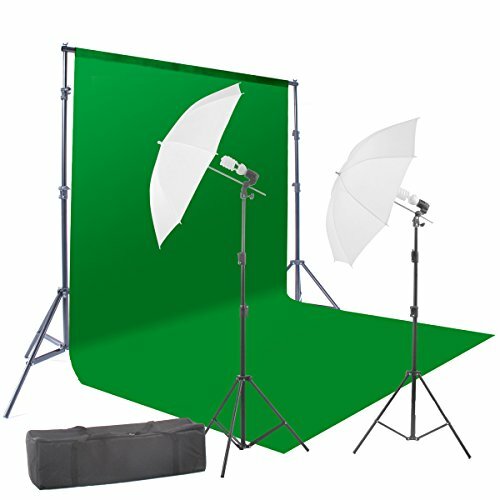 This chromakey backdrop system includes everything you need to set up a green screen set up. The backdrop stand is adjustable in height and width. This chromakey backdrop system includes everything you need to set up a green screen set up. The backdrop stand is adjustable in height and width. 6ft x 9ft Chromakey green backdrop included. 2 point lighting system at 400w used for video or photography lighting. - Height Adjustable: Min 3.5 ft. - Max 8.5 ft.
- Height adjustable Min 53" - Max 84"
- 45 watt fluorescent light bulb = 200 watt Incandescent light bulbs, color temperature 5500K, total output is 400 Watt. These high-output daylight balanced compact fluorescent bulbs are ideally suited for digital photography. They also have very low heat so they don't get hot like the more common photo bulb choices. If you have any questions about this product by StudioFX, contact us by completing and submitting the form below. If you are looking for a specif part number, please include it with your message.